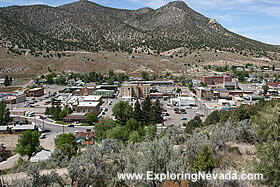 Ely is a great little town located in east-central Nevada. Although Ely is small, Ely has substantial services in town due to the junction of three highways : US 6, US 50 and US 93. Ely is a popular stop-over point for those traveling between Interstate 80 (in the north) to Interstate 15/Las Vegas (to the south). Ely also has a superb location, as it's near several excellent scenic drives and Great Basin National Park. More Information About Ely. Below are the varoius hotels and casino's in Ely that are available for online booking.